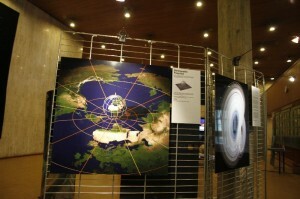 The mounting of the first MPE exhibition at the UNESCO Headquarters in Paris involved two teams, one around Michel Darche and Regis Goiffon from the Centre Sciences and the other around myself from Oberwolfach and IMAGINARY. 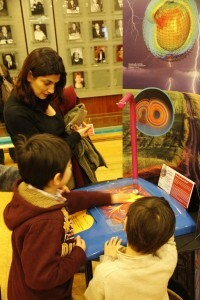 While Michel and Regis developed ten physical exhibits from the collection of the Centre Science, we were in charge of the ten MPE competition modules selected for display, mainly interactive exhibits with computer programs and some pictures and films. We arrived in Paris on Saturday, March 2, to drop the equipment off at the main UNESCO building. The actual mounting of the exhibit started on Monday morning, March 4. 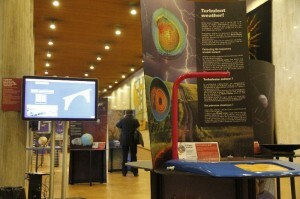 A typical module consisted of a touch screen on a stand connected to a computer and a text board with explanation. Some modules were film stations or had several physical components, like a globe, extra images and some tools to measure angles and distances. 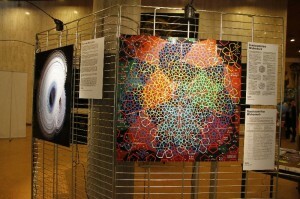 We printed high-quality images of the Lorenz Attractor and the Quasicrystalline Wickerwork and displayed them in a small gallery. The films were put into a loop and shown on a touch screen, with two big sofas for viewing. For many stations, the authors had prepared further reading material or an activity book, which we placed next to the exhibit. 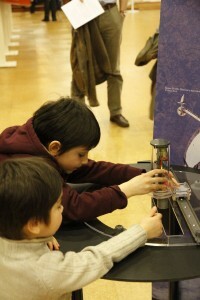 On March 5, at 9:00 am, the first visitors started to explore the 20 modules of the exhibition. 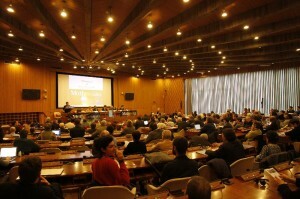 It was great that many authors of the competition modules came to Paris, not only the winners. The winners of the first, second and third prize were announced officially in the morning session of the MPE Day conference. Ehrhard Behrends, head of the jury, gave a brief overview of the modules and presented the authors with their award certificates. 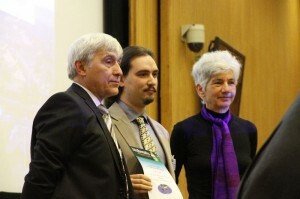 Daniel Ramos, author of the winning module “The Sphere of Earth” gave an introduction to his module. After the lunch break, the exhibition was opened to the public. 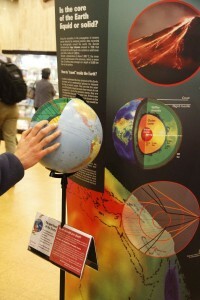 Many of the approximately 250 visitors played with the exhibits and listened to the explanations by the authors of the modules. Here are some pictures of the opening and the exhibition. As I am writing this blog, I am sitting in another UNESCO building, which is located just next to the main one and hosts all UNESCO embassy offices. We changed the site of the exhibition this morning and mounted everything here again, where it will stay until Friday, March 8, and attract a broader audience. We are just having a group of children here, ages 5-12, who all know “GPS” from the car of their parents and are guided by Regis through the physical GPS exhibit. If you are interested in seeing more details about the MPE exhibits, or if you want to download the images or programs – please, go to the Exhibition Web site. On the same Web site you can also contribute your own ideas and suggestions. We are planning to extend the exhibition and show it in many places around the world. This entry was posted in MPE Exhibit, Public Event by Guest Blogger. Bookmark the permalink. Can you please inform us how we can be hosting school for math exhibition . You can download posters and instructional material from the MPE2013 Home Page. Click on the tab “Education”. We wish to be a hosting school of math. exhibition , how can we invite this organization to our school? Who is the contact person for exhibition calender? On this page – on the bottom – you will find all MPE modules.